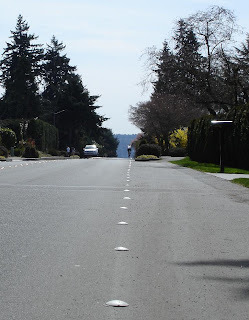 Today I rode 38mi (62km) around the north half of Lake Washington. My actual route was pretty close to this Bikely track. I was surprised by how beautiful and pleasant the ride was near the tiny township of Beaux Arts Village, on the East Side just north of the I-90. I'll work up to a full loop of Lake Washington, which can be as little as 12mi more if one picks busier roads.